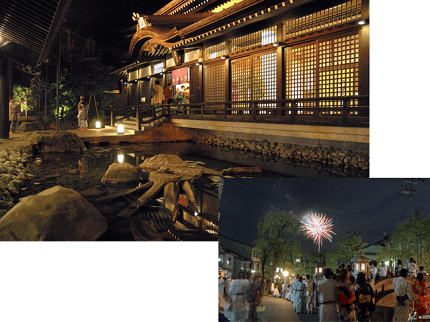 Kinosaki Onsen, the classic Japanese hot spring resort, is located in northern Hyogo Prefecture on the coast of the Sea of Japan. 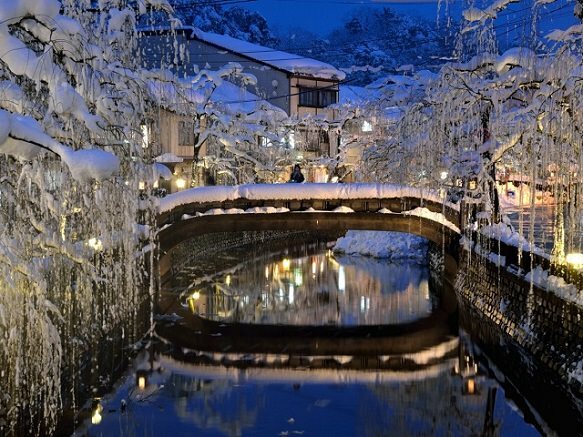 This pleasant town, built along a willow lined river, is one of the top onsen destinations of the Kansai Region. It was around the 8th Traditional wooden houses sit along the willow lined river which carries colorful koi carp through the town center. Hot springs were discovered in Kinosaki around the 8th century and since then the town has developed into a charmingly old-fashioned onsen town. 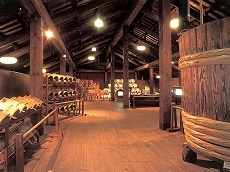 The Kinosaki Hot Spring Resort was once a spa called Tajima-no-yu. When at Kinosaki, visits to numerous public baths is highly recommended to experience the relaxing onsen. A stroll around town in yukata and geta (wooden clogs) will also add a more traditional look to the whole experience. Yukata, casual versions of kimono, literally means “bathing cloth” and has been worn after bathing in communal baths for centuries. 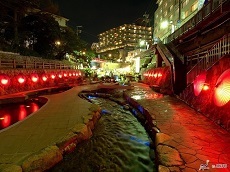 Since more hot springs were found in 1950's, the area has grown to be a new sightseeing and health spot in and around the Hanshin (Osaka-Kobe) district. The Onsenji Temple stands at the western end of town along a mountain slope. Onsenji Temple literally translates to “hot spring temple” and is dedicated to a Buddhist saint who, according to legend, prayed for 1000 days to bring forth spring water to Kinosaki. In the old days, visitors had to first pay a visit to the temple before being admitted to any of the baths in town. While most people no longer make the journey to Onsenji before bathing, the temple remains a nice place to visit.